In the Famous Faces series, I try to profile high-achieving and influential Muslim women, who wear the hijab. In this post though, I've got not one, but twelve ladies who are making us proud. 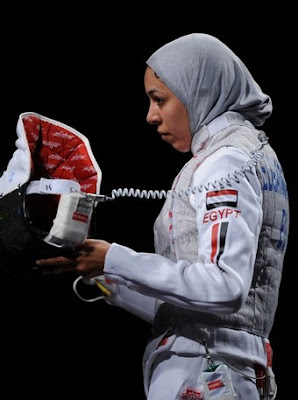 These twelve are the hijab-wearing Muslimahs who will be competing at the Beijing Olympics. You can read about a few of them here. Sara Khoshjamal was also placed at no. 22 by Time magazine in its top 100 athletes to watch! 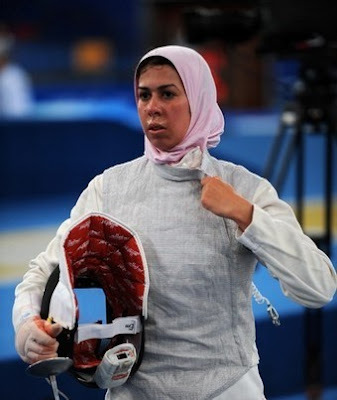 Also taking part is Samah Ramadan who is competing in judo for Egypt. Any other sporty readers out there? Who are your favourites out of these ladies? this is so lovely and inspiring to see mashallah! Absolutely love your tribute to our sporty sisters in the ummah! 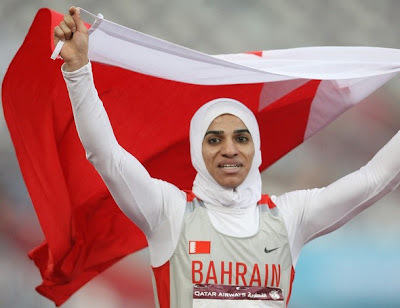 I'm especially impressed with the siters that wear hijab in track and field or any speed plus wind competition. Excess clothing creates so much "drag" when running. In the 100m and 200m races every 1/100th of a second is signifigant. I currently train and teach Teakwondo . . . in hijab. 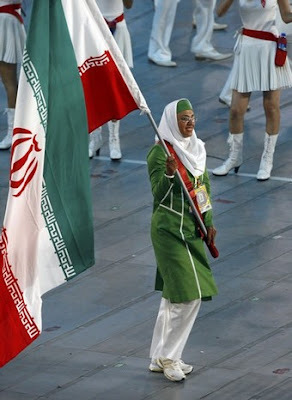 I was thrilled to watch the Olympic opening ceremony to see so many hijabis among the athletes. Thanks for highlighting the women who don't fit stereotypes. Hey, I just found out that Soraya Haddad an Alegerian judoka won the first medal for Africa and the Arab World. She is not hijabi but its sure exciting all the same. She won the bronze in her event. Jazak Allah kheir for this post. Masha'Allah may Allah reward them for not compromising. With your permission, i shall introduce your blog to Malaysian women group in bahrain as well as in Malaysia. Impressive. Ok next no offence but can we have a feature on hijabbed sportswomen who've actually WON some medals in MAJOR events? It's not always inspiring 2 read abt how a hijabbed sportswoman finishes in say, 99th place in, say, a 100-people marathon. This proves hijabs don't stop women from doing much. I did see a video on youtube with hijabis serving in a police force (I don't know if it's true or not) but it was still an inspiration to my eyes. So now I guess the "hijab safety" regulations are wrong. 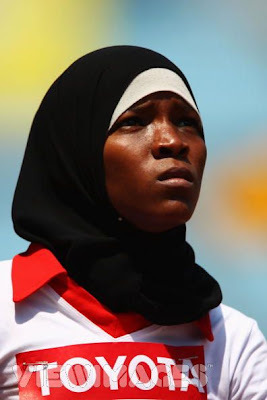 Look at all these amazing Muslim women in the Olympics! Thanks for sharing! 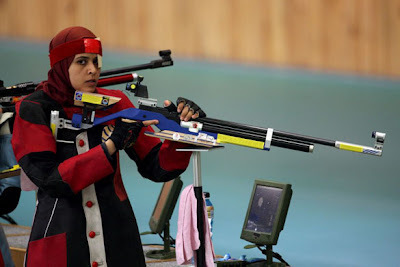 I was waiting for someone to show pictures, at first I didn't know Muslim women even participated in the Olympics. Thank you very much for such a wonderful post! Very inspiring, indeed. I'm a Muslimah but not a hijaabi but I hope to become one sometime in the future. Until then I just want to really understand my religion. 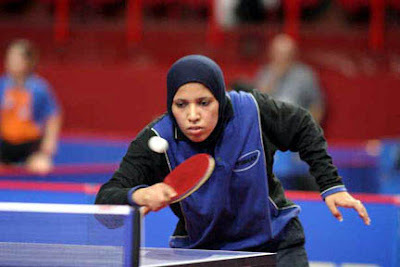 It's good to know that being a hijaabi will not stop us from being sporty. thanks again for such a lovely blog! Please don't stop posting. Yes, I have blogged a few updates on those sisters in the Olympics.. and their pictures are adorable. You sure secured a pic of each one! I had to search all over for just a few news articles. Fekri, the Persian Tae Kwon Do fighter is my favorite. A martial artist myself.. I dig a hijabi that knows how to handle herself and throw a few good kicks/jabs. The Persian archer is adorable in her baseball cap. I'm totally going to have to try that style as a dressed down sporty look. shukran for the lovely post. i cannot wait until my daughter wakes up from her nap so that i can share these beautiful pictures with her, masha Allah. i hope you don't mind but i included a link to this post on my blog. Thanks for the post! ... but what about Maitha bint Mohammad who carried the UAE flag? While I'm neither Muslimah nor hijabi (I'm an American Catholic, but an Arabic-speaker who has lived in Muslim countries), I just finished talking to a group of Egyptian teachers about how to confront stereotypes of Muslims/Islam/Arabs in America. We talked a lot about hijab and the importance of showing students successful, competent women who wear hijab. Inshallah I'll be forwarding this link to all of them so they can show their new American students. Thank you for pointing out such talented women who do not sacrifice their faith for their God-given talents. I am not a muslim. Anyway, I think everyone has the right to decide what they are wearing during the sports as they can perform well even cover the whole body. This is basic human rights. No one should be forced to wear or wear not hijab. So I am glad to see that Olympic games respect every religion practices. So you're not proud of the non-hijab wearing competitors? That's a shame! You should at least mention them as well! Aisha, I had to search a lot lol. Najmeh is actually wearing a visor, with the hijab wrapped over it, rather than a cap. I saw it in another photo of her. hs, again, Maitha did not compete in hijab. bint_ibnbattuta, you're welcome! It's up to us to show people that hijab is not a barrier to achieving our potentials. Anon 2, huh? Where did I say I wasn't proud of them? Did you not read my response to Sharshura above? This blog is about HIJAB hence I profile women who wear HIJAB, not those who don't! And I don't need you to tell me what I should and shouldn't post on my blog, thank you! Wow. I fence in a hijab for fun and I thought I was an outsider and wierdo and considered dropping it as a sport. Well i think i'll continue now.... it's real fun. but it gets really hot sometimes.